Regardless of where your workshop is located, one of the key tools in there is most likely your workbench. Have you ever really given much thought to where it’s positioned in the floor plan? I know I haven’t, until recently. Not so long ago it became very obvious to me that workbench placement can be a huge advantage in a project. For example, normally my bench is simply pushed against a wall. This works for me, most of the time, but once in a great while I have a project where I need a full 360º access to it. Usually it’s during the assembly process when I need access to both sides for clamping and adjusting. But in my small shop that means I need to give up valuable floor space, something I’ll do very begrudgingly, and only when I’m in a real pinch. So if that’s how I feel about it, then why am I even bringing up the subject? I’m glad you asked! Well, I’m thinking about changing my mind and giving up a little bit more floor space to take advantage of the convenience of having the 360º access all the time. The real question is whether or not I move it out into the middle of the shop floor, or maybe just perpendicular to the wall, or maybe just slightly askew from the wall? All along, the reason the workbench has been such a wall flower is because my current version isn’t very heavy. Usually I need the wall to keep it from moving all around the shop floor when I’m doing any kind of hand planing. Of course the obvious solution is to make a heavier workbench. Which, if you’ve been with me for a while now, know is on the to-do list and the tall stack of 6/4-8/4 maple in the back of the shop is for that purpose. But in the meantime I have a hunch turning the workbench so it sticks out into the middle of the shop floor is my best option to get that increased access to my projects. So where’s your bench usually placed? Is it a permanent fixture in one location or do you move it around as needed? 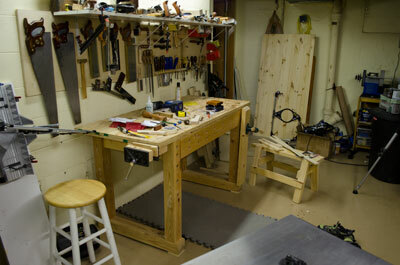 Leave a comment and share with us your workbench situation. I have a similar issue. I’m getting ready to make a bench similar to yours except heavier to use for carving and the use of hand tools. I’m replacing a built in bench. Currently in the middle of the room I do have a roll around workstation that serves well for assembly. So what I’m saying is that having my bench against a wall may work for me? My shop space is 16ft x 16ft. My main bench is a 4×16 affair along the wall consisting of a big heavy top over four stainless tool cabinets. I have a nice, heavy rolling work table I do most assembly and many processes on. It works for me as my small shop wouldn’t accommodate a large heavy centrally located fixed bench. And based on the “bed build”, reconsider starting the big bench. I don’t have enough time left in my life to see you go to completion….chortle. My latest bench is against one wall. The other two benches are affixed to the walls and carry enough additional weight from tool storage and mounted equipment that they wouldn’t move even if they were detached. The latest bench is a laminated Douglas fir 2×4 top with 4×4 legs. It is heavy but not massive because I wanted to be able to move it into the open space in the middle of my 16’x30′ workspace. It’s heavy enough not to move while planing. The only real planing I’ve done on it is planing the top flat. Now that I have it I intend to do more. As soon as I finish the vise. It’s always going to be a project because I’ll never reach perfect. It’s a fun trip though. 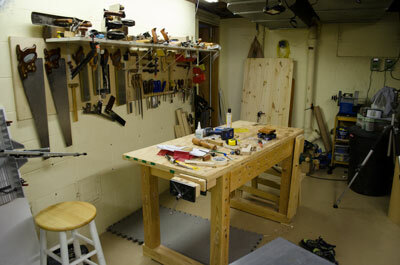 Your workbench should be stiff enough that can easily manage the heavy loads and tools. My bench is a little less than foot away from the wall, this allows my cabinets not to get in the way. I have tried different arrangements but this is what I prefer. The only thing other thing I would consider would be if I turned my bench 180° so while at the bench my back would be towards my tool cabinet, but this isn’t an option since I want to be able to get a vehicle in if I choose. I have a separate assembly bench for glue ups which changes the situations we are in. All in all I couldn’t be happier with my layout, building my Roubo is probably the best shop project I have ever done-and I’ve done a lot over the years, it allowed me to truly enjoy hand tools and get better results from them. I too have a space problem, partially from physical size and part from not knowing just how to arrange things. My bench is hidden under a pile, I move what I need if I need the bench for the vice, to plane or pound. I have a table top made for my Shopsmith that gets the most use. I drop it in place for assembly, glue up, sanding etc. « H.O. Studley needs you!